Would You, Could You . . .
Oh the places you will go this weekend! The Mineral Point Opera House is the venue for the Mineral Point High School production of “Seussical the Musical” starring The Cat in the Hat and a host of other familiar characters in this complex amalgam of Dr. Seuss books including Horton Hears a Who, One Fish Two Fish, Red Fish Blue Fish and Green Eggs and Ham. The performance features 30 talented students, a professional level pit orchestra, cool lighting effects and colorful costumes and artistic sets. Would you drive there in a car? Or will you walk, if it’s not too far? Would you sit in a balcony or the box? Would you, could you see Dr. Fox? As you enjoy the beautiful Opera House? We’re excited to see the Seussical. It’s a family friendly musical! 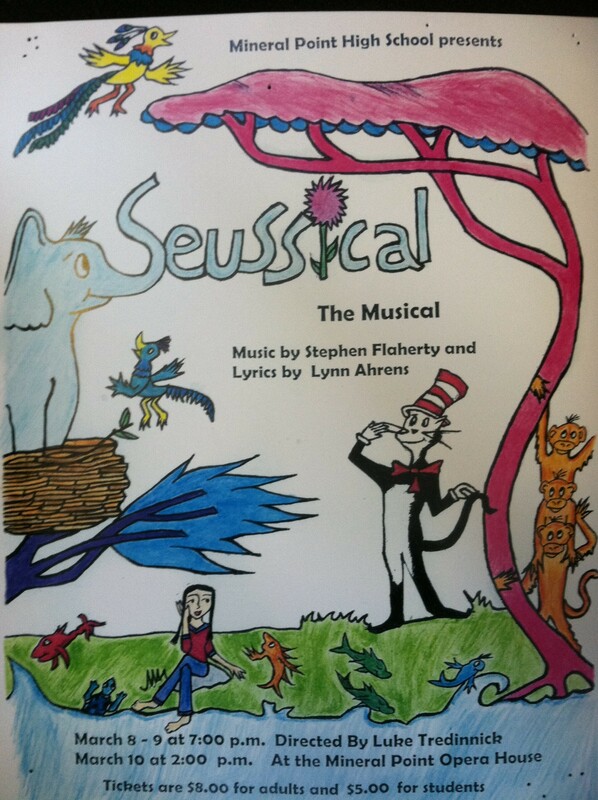 Performances are Friday March 8, 2013 and Saturday March 9th at 7:00pm and a matinee on Sunday March 10th at 2pm. Tickets are $5 for students and $8 for adults. Gallery | This entry was posted in Entertainment, Family and tagged Dr. Seuss, Mineral Point High School, Mineral Point Opera House, Seussical the Musical. Bookmark the permalink. 2 Responses to Would You, Could You . . . I can’t think of anything more fun to watch than Dr. Seuss! Thanks to the Music Department for brightening up our winter!